A big container of fresh, picked yesterday Northern Michigan morels. My dad and his brother always find baskets of them. Yes, I said baskets. Free. That is if you know where to find them and I'm not telling. My dad sent them with my mom for me to use in the next day or two. 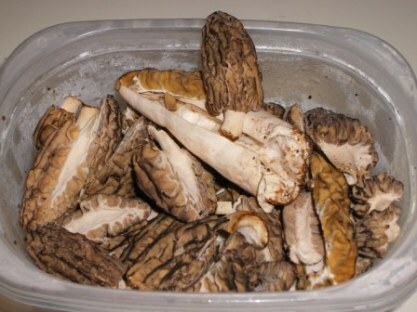 I see lightly sauted in butter morels with a splash of white wine and garlic in our future. I love May in Michigan. Making Dough Stretch The Daring Baker's Way!